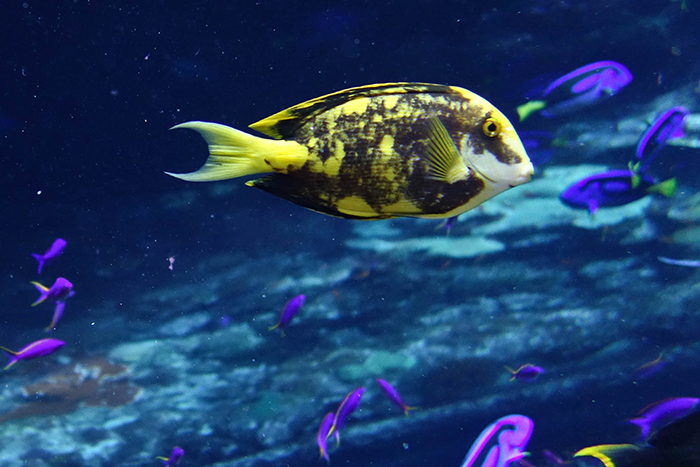 Aberrant Tangs are one of the most striking and unique fishes an aquarist can obtain, and for that reason they demand extremely high prices when they are rarely offered for sale. For our purposes, “aberrant” refers to coloration or patterns that are significantly different from the normal coloration of the fish. This can be as simple as a small blemish or be a complete mess of koi-like coloration. Later in this article I’ll describe a case of multiple Tangs developing aberrant coloration in captivity. This on its own is odd enough, but what makes this even stranger is that the only individuals affected belong to the sister genera Acanthurus and Ctenochaetus which seem to exhibit aberrant coloration only very rarely in the wild. Before I get into that, an overview of aberrations in the family Acanthuridae will help to give us some context for what we are seeing. 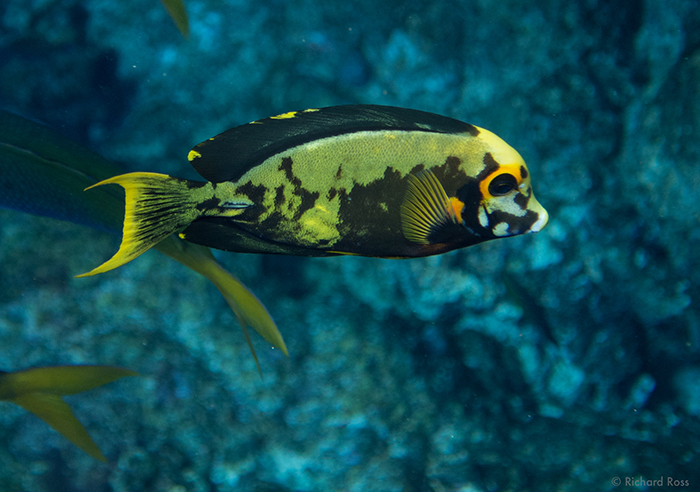 There are many examples of aberrant individuals among the Surgeonfishes, or Tangs. One of the first widely publicized examples of an aberrant Tang was a Scopas Tang (Zebrasoma scopas) kept by master aquarist Greg Schiemer. 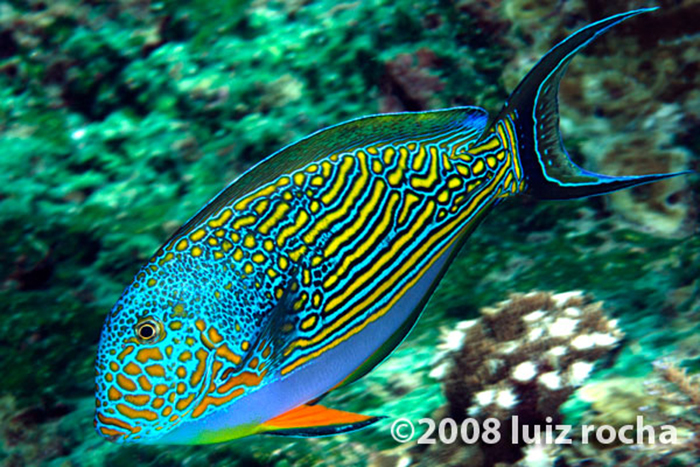 This so-called “Tricolor Tang” had a unique and blotchy color pattern unlike the typical Scopas Tang. When it was purchased it was mostly yellow with a white tail. 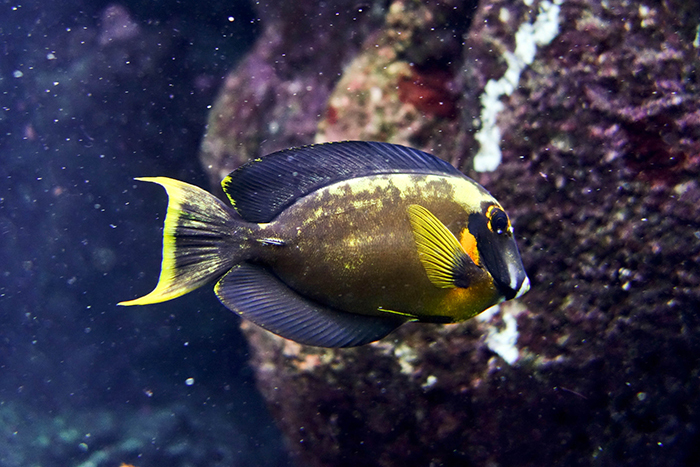 Over time in captivity the front half of the fish gradually developed typical Scopas Tang coloration, but the white tail and yellow back remained (Schiemer, 2002). 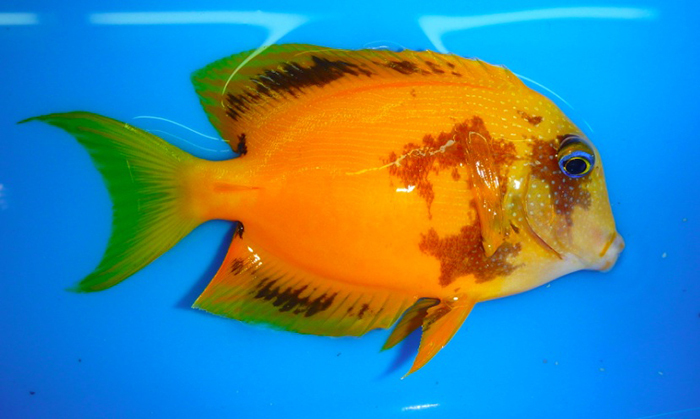 There are now multiple examples of Tricolor Scopas Tangs collected from the wild which show varying degrees of irregular yellow, white, and pale brown blotches (Carvallo, 2013). Aberrations in the Scopas Tang are not a localized phenomenon; multiple examples have been collected in East Africa, the Andaman Islands, and Vanuatu (Carvallo, 2013, Ho, 2013, Norton, 2013) and probably occur throughout the species’ range. There are also many examples of aberrant individuals in the closely related Yellow Tang (Zebrasoma flavescens). Yellow Tang aberrations are generally all characterized by having irregular white patches that may cover some or all of the body (Adams, 2011). These aberrations currently appear to be stable and do not revert back to wild coloration in captivity. 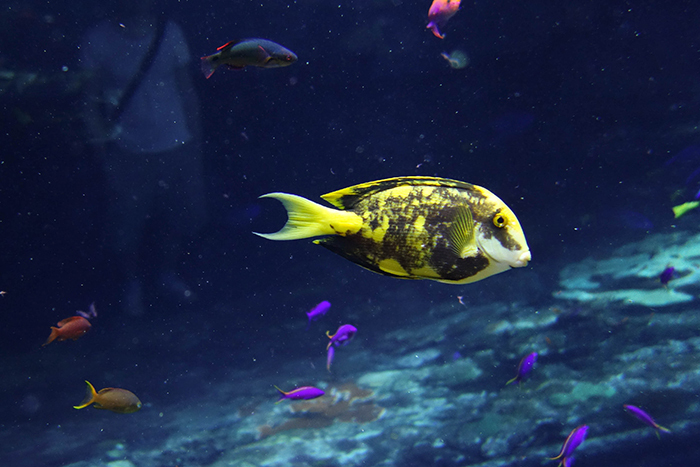 There is one known photograph of a similar aberration in the Purple Tang (Zebrasoma xanthurum) with white and yellow blotches on a regularly purple body (Adams, 2011), but it is unknown if this fish’s condition is stable in captivity. 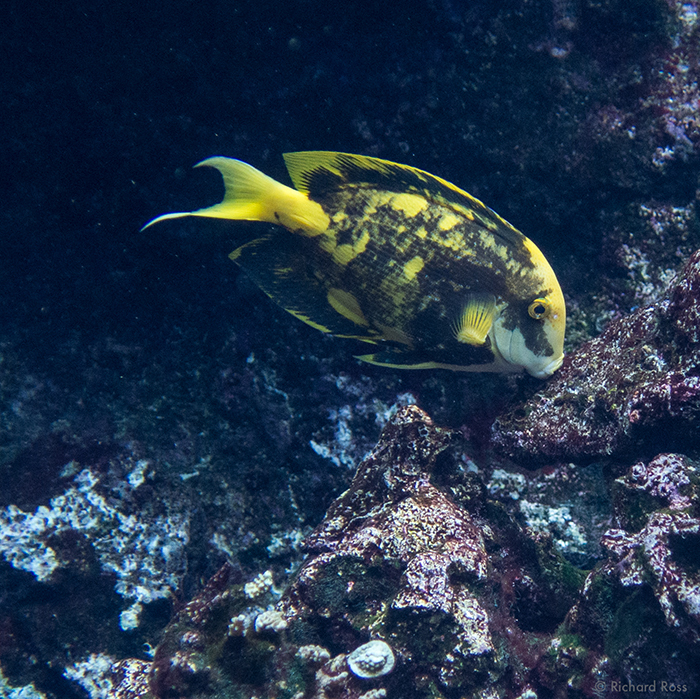 Aberrant morphs of the Clown Tang (Acanthurus lineatus) have been found where the normally smooth blue and yellow horizontal lines on the sides of the body are replaced with a vermiculated or honeycomb mess of blue and yellow (Rocha, 2013). 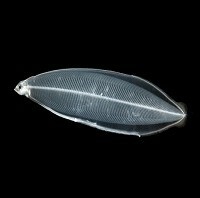 Four individuals displaying this unique aberration were caught by Dr. Luiz Rocha on a single reef at Christmas Island, but otherwise it has not been reported or photographed in the wild or aquarium. These fishes seem to have normal levels of pigment, however. 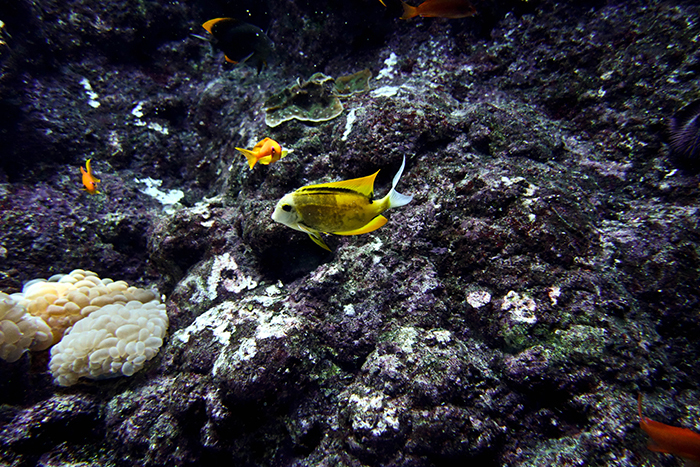 A few rare individuals of unknown species of Acanthurus that appear to be A. pyroferus displaying blotchy aberrant coloration have been photographed in the wild and collected but unfortunately the details of sightings, collection location, and ultimate fate of these fish is unknown (Kai, 2014). I’m unaware of any Acanthurus that have held their aberrant coloration in captivity long term. A. lineatus. Photo by Luiz Rocha. The genus Ctenochaetus is closely related to Acanthurus, and aberrations likewise seem to be very rare in this group of fishes, and unknown in captivity long term. Recently Julian Sprung contacted me to share some photos of aberrant Ctenochaetus from the Walt Smith International collection station in Fiji that appear to be C. binotatus. Their normally yellow body had irregular blotches of brown on the side of the head, body and tail. The collections manager, Cameron Bee, further explained that these fish were all caught at a single reef and that there were more to be had. 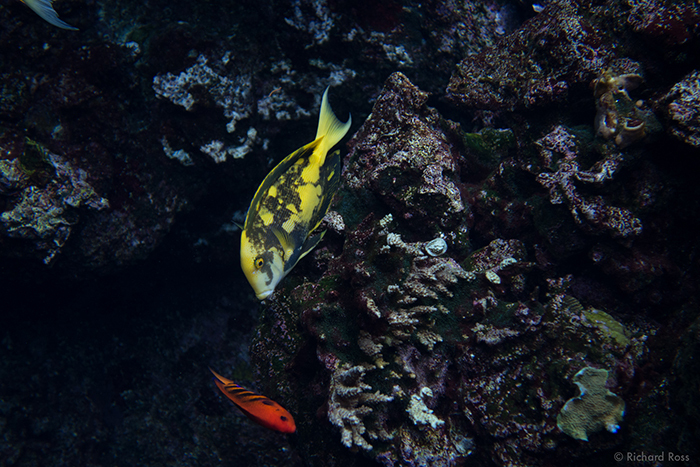 Unfortunately, these fish reverted back to their normal yellow coloration within a few weeks in captivity. C. binotatus. Photo by Cameron Bee. 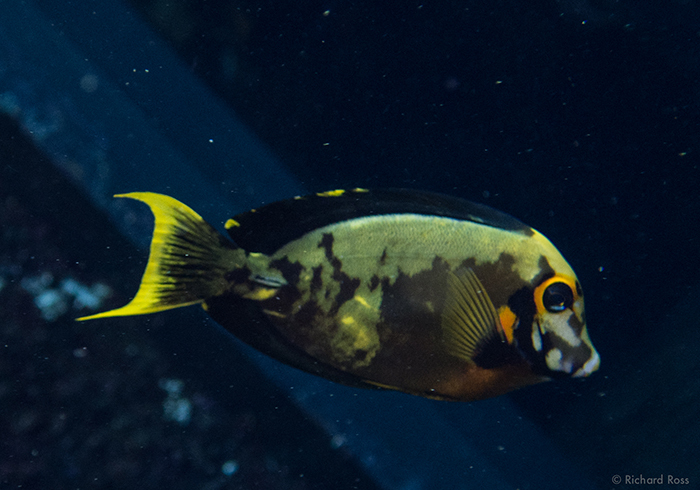 The familiar Hippo or Regal Tang, Paracanthurus hepatus, displays a unique aberration in which the black area which normally forms a palette shape on the side of the body will instead cover nearly the entire body and head. One such individual is on display at the Sydney Aquarium and has kept the aberration for many years (Wilkes, 2011). There are multiple examples of this aberration documented with photos on hobbyist forums. To my knowledge no aberrant specimens of Prionurus or Naso have been reported in the wild or aquarium trade. 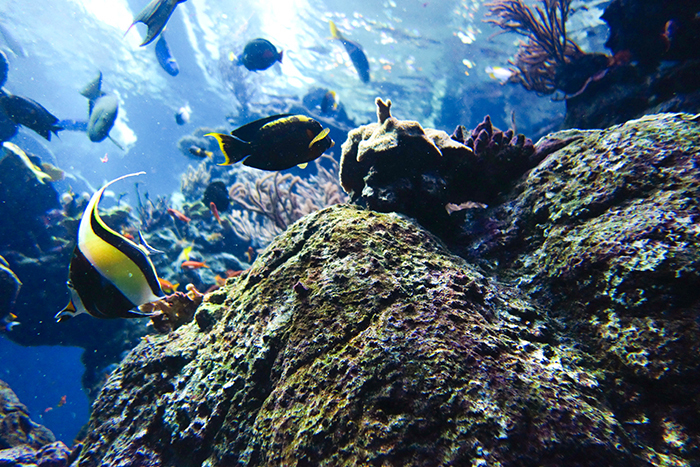 The 200,000 gallon coral reef exhibit at the Steinhart Aquarium, California Academy of Sciences houses approximately 140 tangs, representing 23 species. Most of these fish were obtained from collectors in Hawaii, Vanuatu, and the Philippines between 2007-2009, although some were donated by local hobbyists or from other public aquariums. I either had a hand or an eye on every single one of these fish before they were added to the exhibit, and can attest that every one of them had normal, wild coloration up until about 2012. 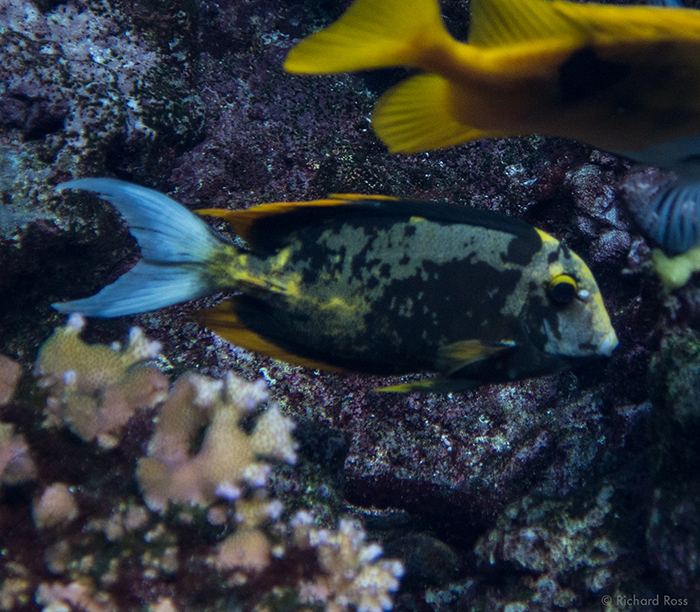 At that point several individual Tangs from 3 species started showing pigment loss or alteration on various parts of their body. The initial reaction that they may have HLLE was quickly eliminated. The spots are not lesions, but rather irregularly pigmented blotches on what appears to be otherwise healthy skin. The very first aberrations we noticed were small depigmented areas around the lips and head of several large Orange Shoulder Tangs (Acanthurus olivaceus). It’s hard to pinpoint exactly when we noticed aberrations develop, or correlate it to any change in the tank, but one intriguing possibility is that the aberrations developed at the site of injuries to the fish due to a new feeding system. In 2012 an autofeeder system was added to the tank to accommodate smaller planktivorous fish (Ross et al, 2013). A mixture of planktonic foods was delivered to the tank via four 3/8” tubes that sat just under the water surface. When the pumps that delivered the food kicked on every 10 minutes, all the larger fish rushed the tubes to grab as much as possible and were rubbing their faces and mouths on the tubing. Were these the source of the affected areas on the Orange Shoulder Tangs? The evidence seemed compelling; this species tends to be the most pushy at feeding time and always finds itself in the front of the pack, and the aberrantly colored areas were exactly where you would expect them to be if injury from rubbing on the tubing was the cause. At this point we suspected that perhaps a secondary infection was causing depigmentation in the affected areas. We fixed the tubing so the fish wouldn’t rub on it any more, but then we started seeing the aberrations on other parts of the body, like the tail, that made less sense, and then we started seeing the aberrations on smaller species of tangs, specifically the Tomini Tang (Ctenochaetus tominiensis) and the Mimic Tang (Acanthurus pyroferus) that didn’t really participate in the mad dash at the autofeeder. After some time several Mimic and Tomini Tangs had depigmented areas all over their body, and started to look a bit like koi. What was going on here? Had we unleashed some unknown pathogen into the tank that affected only three species of fishes, and not all individuals? 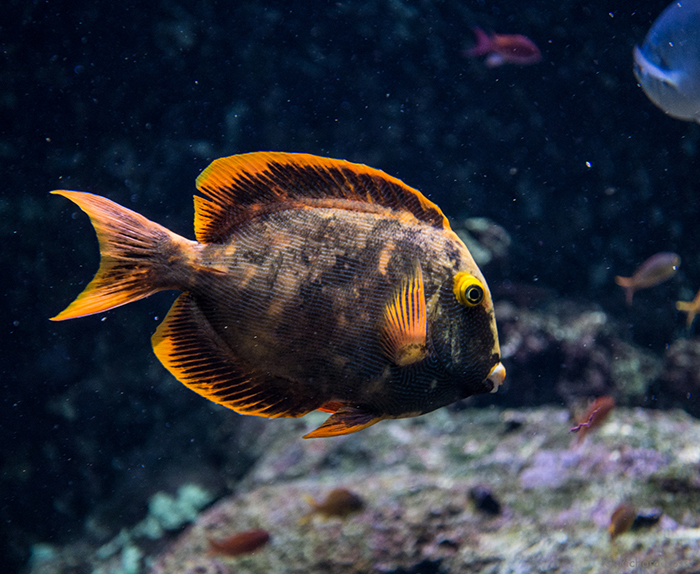 In an effort to answer some of these questions we came to the difficult decision to sacrifice one fish, an adult Orange Shoulder Tang, to perform a necropsy on it and send off parts of its body to a pathology lab to see if we had an infectious disease on our hands. Unfortunately that test was inconclusive, and didn’t find any obvious pathogens or signs of disease in sections of affected skin (Dunker, 2013). 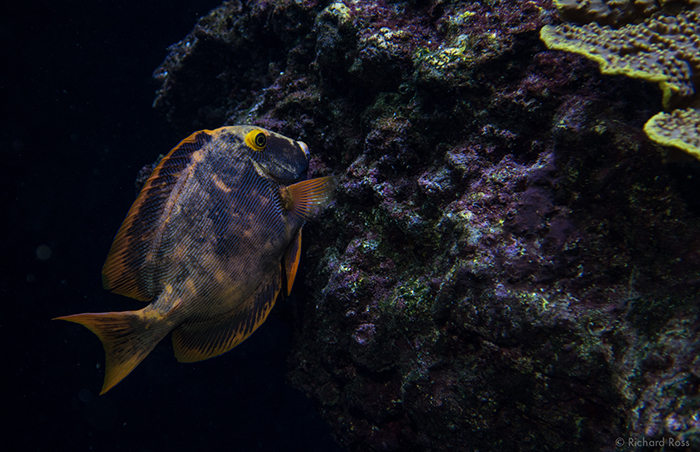 As of this writing there are there are a total of 27 Tomini, 13 Orange Shoulder, and 7 Mimic Tangs in the tank; approximately 20-30% of the Tomini and Mimic Tangs show some degree of aberration, with some fish being completely affected all over their body, some showing a small spot here or there, and the rest looking like completely normal wild types. 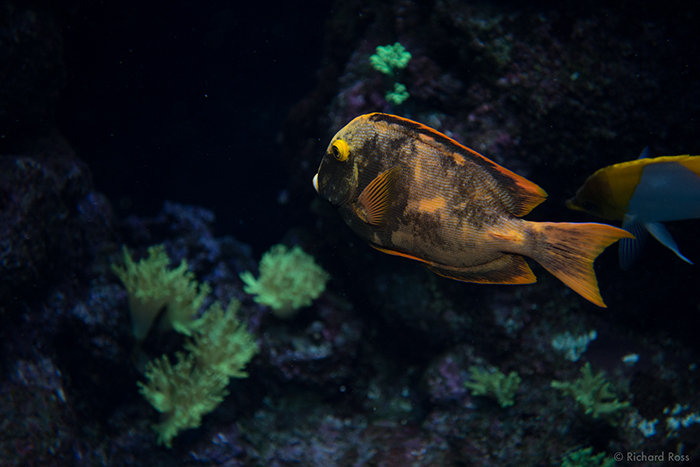 The Orange Shoulder Tangs look mostly normal, with a bit of yellow or white coloration around their head, lips and tail on maybe 2 or 3 individuals. Interestingly enough none of the 15 Scopas Tangs show any trace of aberrant coloration. There doesn’t seem to be any correlation between size, apparent health, or rank in the “pecking order” of the fish and whether it displays aberrant coloration or not. If you sit in front of the tank long enough you can observe multiple social interactions between Tomini Tangs as they constantly maintain their pecking order, and you can see aberrant individuals both picking on and being picked on by wild type individuals. Lots of changes have been made to this exhibit over the years, so it is very difficult to narrow down other potential reasons that may be causing the aberrant coloration we’re seeing. We’ve switched salt mixes, added filtration types, changed foods and the way we feed, added new fishes, added new corals, fiddled with amounts of artificial and natural light getting into the tank, etc. If I had to put on my speculation hat, and I have to do that a lot, I’d say that what we’re seeing here is the result of some unknown infectious disease, perhaps a virus, that affects fishes with weakened immune systems or that are otherwise stressed, and also that it is a distinct phenomenon from the aberrations seen in collectedZebrasoma spp. But if that’s the case, why aren’t aquarists all over the world seeing their Mimic and Tomini Tangs develop aberrant coloration in captivity? 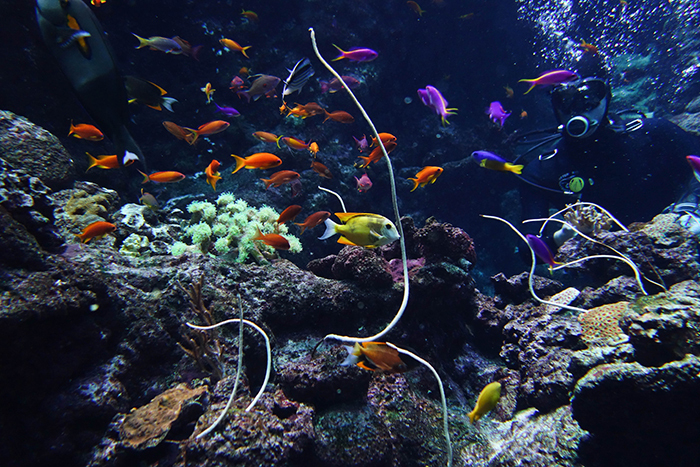 Certainly similar conditions exist for these fishes in other aquariums. Do the large social groupings in the exhibit contribute to maintaining the aberration? Could this help explain why some fish lose their aberrant color in captivity? There are certainly a number of important questions that remain to be answered and more research to be done before we find out exactly what is causing this unique situation. I’d welcome anybody with thoughts or ideas to contact me at mwandell@calacademy.orgReferences Adams, Jake. “Piebald Purple Tang is grotesquely awesome” Reefbuilders.com. 2011.
http://reefbuilders.com/2011/11/23/p…quely-awesome/ Adams, Jake. “The White Scopas Tang”. Reefbuilders.com. 2011.
http://reefbuilders.com/2011/04/28/white-scopas-tang/ Adams, Jake. “The Piebald Yellow Tang”. Reefbuilders.com. 2011.
http://reefbuilders.com/2011/04/26/piebald-yellow-tang/ Bee, Cameron, Walt Smith International, pers. comm. 2014. Carvallo, Jon. “The Indian Ocean is producing some really nice tricolor Koi Scopas Tangs”. Reefbuilders.com. 2013.
http://reefbuilders.com/2013/08/20/i…-scopas-tangs/ Clements, K.D., R.D. Gray, and J.H. Choat. 2003. Rapid Evolutionary Divergences in Reef Fishes of the Family Acanthuridae. Mol. Phylogenet. Evol. 26: 190-201. Dunker, Freeland, DVM, California Academy of Sciences, pers. comm. 2013. Ho, Leonard. “The Calico Tang”. Advanced Aquarist Online Magazine. 2013.
http://www.advancedaquarist.com/blog/the-calico-tang Kai, Tea Yi, Singapore, pers. comm. 2014. Norton, Grant, SRS Vanuatu, pers. comm. 2013. Rocha, Luiz, California Academy of Sciences, pers. comm. 2013. Photos at: http://reefcentral.com/forums/showpo…&postcount=228 Ross, Richard, Matt Wandell, and J. Charles Delbeek. 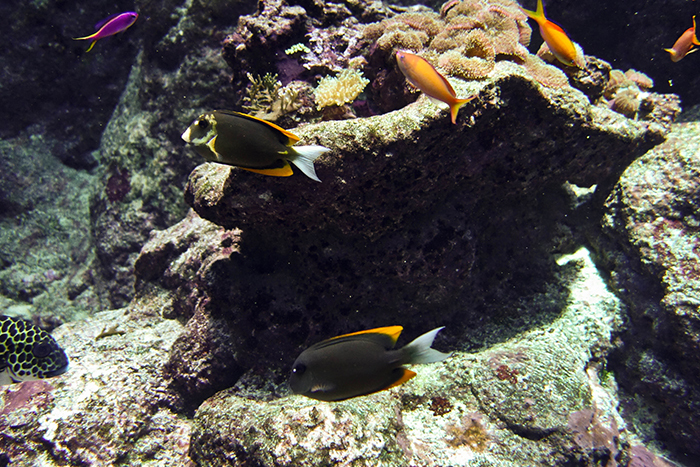 Small Fish Feeding in a 212,000 Gallon Coral Reef Exhibit. Drum and Croaker. 2013. Schiemer, Greg. Aquarium Fish: The Venerable Scopas Tang. Advanced Aquarist Online Magazine. 2002.